ohn Llewellyn was a playing card manufacturer active between the years 1778-1785. During this period he traded at No. 25 Piccadilly, London. 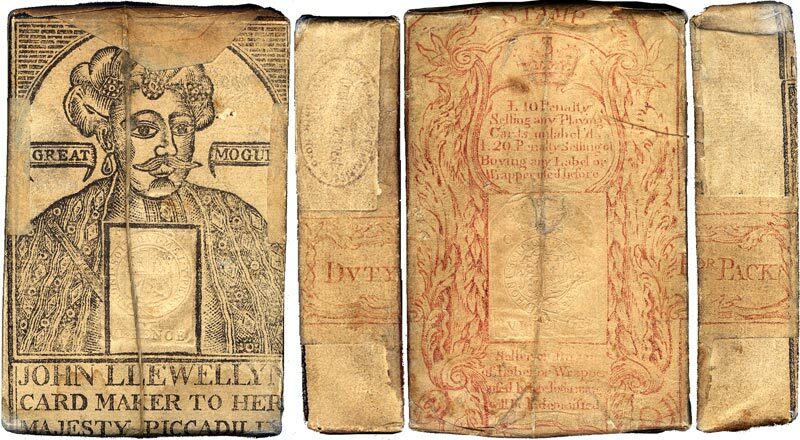 The image above shows an unopened pack of Great Mogul playing cards, in it's original wrapper, still bound with the string and showing the embossed tax stamps. 'Her majesty' would have been Queen Charlotte, wife of George III. It is not known whether John Llewellyn was a Welshman, or a descendant of a Welsh family who had moved away, but it seems likely. His name is not in the list of liverymen of The Worshipful Company of Makers of Playing Cards nor does it appear in British Library records. Little is known about him. The corresponding court cards are shown below. Images courtesy Ken Lodge. Hall took over the address (and the business?) in 1785. Above: the ace of spades has "six pence addl. duty" printed around the sides, which was valid from 1776-1789. 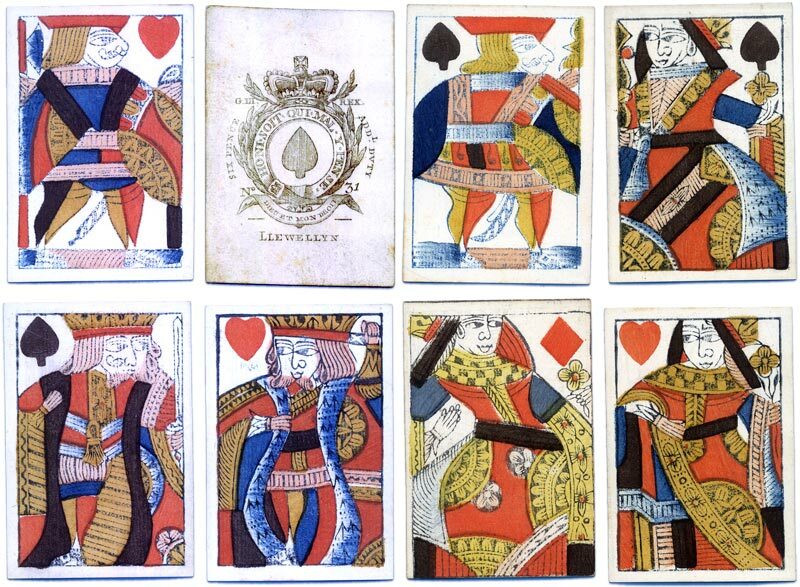 The court cards are printed from woodblocks and coloured using a brush and stencils. 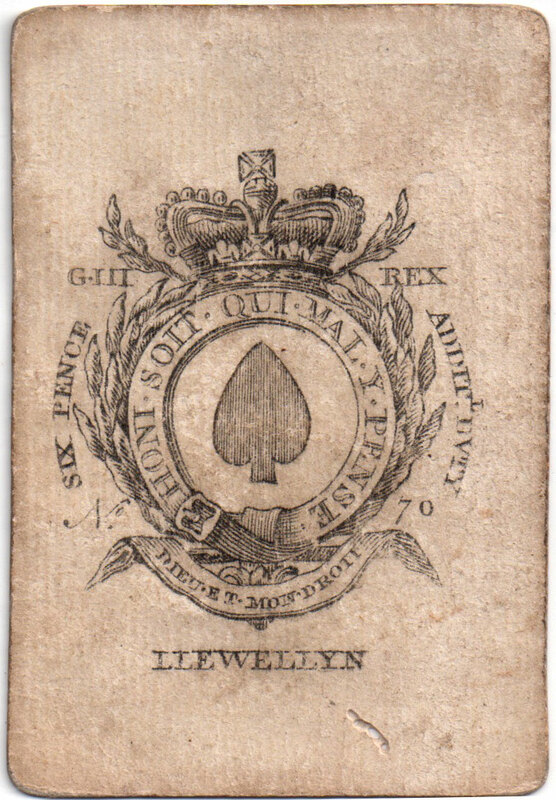 The court card designs and ace of spades are completely standard English pattern and there is no suggestion or concession towards Welsh nationality. Some of the court cards are not stylistically consistent (eg queen of diamonds) but resemble those made by other manufacturers (i.e. Gibson/Hunt) as woodblock makers were freelance and supplied more than one customer.